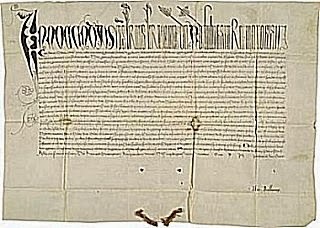 "According to their deserts": "Witches" and the Papal Bull "Summis desiderantes affectibus"
Issued by Pope Innocent VIII on this date in 1484, the papal bull (a written, legal order, so called because of the bulla, or lead seal, used to authenticate the document) known as Summis desiderantes affectibus recognized the existence of witches and witchcraft and extended papal authority for the pursuit, imprisonment, and "correction" of witches "according to their deserts." It has recently come to our ears, not without great pain to us, that in some parts of upper Germany, as well as in the provinces, cities, territories, regions, and dioceses of Mainz, Ko1n, Trier, Salzburg, and Bremen, many persons of both sexes, heedless of their own salvation and forsaking the catholic faith, give themselves over to devils male and female, and by their incantations, charms, and conjurings, and by other abominable superstitions and sortileges, offences, crimes, and misdeeds, ruin and cause to perish the offspring of women, the foal of animals, the products of the earth, the grapes of vines, and the fruits of trees, as well as men and women, cattle and flocks and herds and animals of every kind, vineyards also and orchards, meadows, pastures, harvests, grains and other fruits of the earth; that they afflict and torture with dire pains and anguish, both internal and external, these men, women, cattle, flocks, herds, and animals, and hinder men from begetting and women from conceiving, and prevent all consummation of marriage; that, moreover, they deny with sacrilegious lips the faith they received in holy baptism; and that, at the instigation of the enemy of mankind, they do not fear to commit and perpetrate many other abominable offences and crimes, at the risk of their own souls, to the insult of the divine majesty and to the pernicious example and scandal of multitudes. by virtue of our apostolic authority, . . . it shall be permitted to the said inquisitors in these regions to exercise their office of inquisition and to proceed to the correction, imprisonment, and punishment of the aforesaid persons for their said offences and crimes. . . . The bull was a direct response to an appeal to the pope by Heinrich Kramer, a Dominican inquisitor. Two years later, Kramer would produce the infamous Malleus maleficarum (The Hammer of Witches), a "handbook" for the prosecution of witches, published in Speyer (in the Rhineland-Palatinate) in 1487. The Dominican theologian Jacob Sprenger was long believed to be a co-author of the Malleus--he was specifically named, along with Kramer, in the papal bull as one of Innocent's "beloved sons," an inquisitor in pursuit of "heretical depravity"--but Sprenger's role in the authorship is now debated. The Malleus is a horrific book, pornographic in its detailed and graphic descriptions of how to examine witches' bodies, unquestionably misogynist, and brutally violent. Part 1, Question 6, which asks "Why it is that Women are chiefly addicted to Evil Supersititions," "Why Superstition is chiefly found in Women," and "What sort of Women are found to be above all others Superstitious and Witches" (quick answer--any woman who is "ambitious"), is particularly revealing, though it just sets the tone for what follows. After presenting the book to the theology faculty of the University of Cologne in 1487, Kramer found that his book was rejected and condemned. (Kramer ignored this inconvenient judgment and included an endorsement by the university--fraudulently--into subsequent editions.) He also implied papal approval of his book by prefacing the Malleus with the text of Innocent's papal bull, though clearly the bull predated the book itself, and thus it did not endorse the book. And although Kramer and his work were reportedly denounced by the Catholic Inquisition in 1490, his book proved to be wildly popular--as one editor notes, there were "fourteen editions between 1487 and 1520, and at least sixteen editions between 1574 and 1669." These editions "were issued from the leading German, French and Italian presses," and reportedly sold more copies than any other single printed book except the Bible. I have been amused--and appalled--at the number of online sources that attribute the Malleus and the persecution of witches to the "medieval" or "late medieval" period (here's just one, the first link that comes up on Google). Because the witch-hunting hysteria that plagued Europe (and the American colonies--the Salem witch trials were in 1692-93!) for more than two hundred years, extending well into the eighteenth century, were a phenomenon of the modern world, not the medieval, the "age of reason," not the "age of faith." 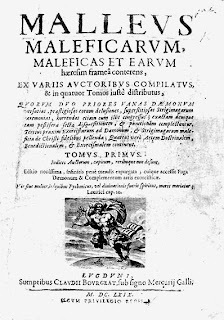 You can view an online facsimile of a 1494 edition of the Malleus maleficarum, printed in Nuremberg, by clicking here (this is made available by the digital collection of the National Institute of Health's U.S. National Library of Medicine). There are many, many online English translation of the Malleus maleficarum, as well as readily available print editions. I've quoted Montague Summers's introduction to his very popular translation, originally published in 1928. There is also a huge literature on the witchcraft persecutions if you are interested.